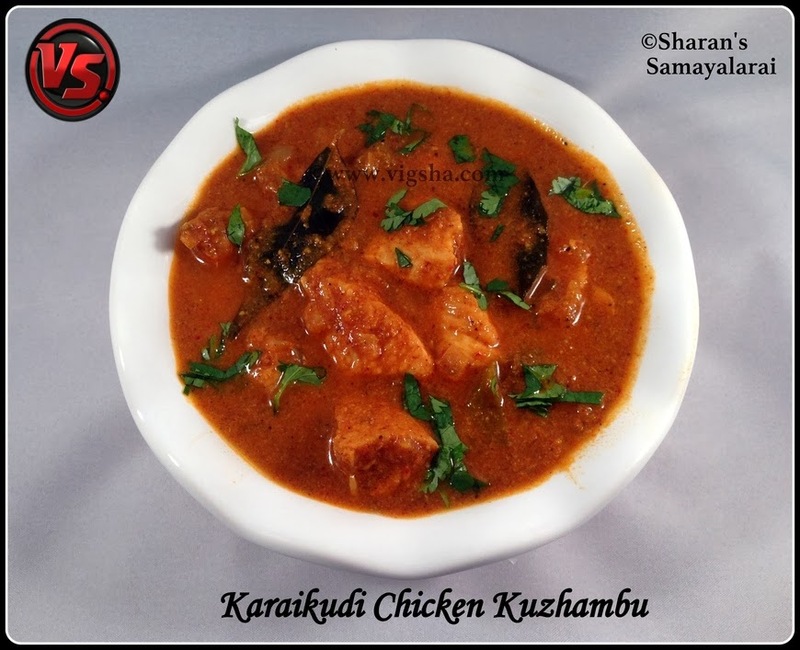 Karaikudi Chicken Kuzhambu is an authentic chicken gravy prepared using grounded spices. Karaikudi is the home of Chettinad Cuisine, it is widely known for its specialty food. Also it is famous for the type of houses built with limestone called 'Karai Veedu'. This spicy gravy goes with Pulao varieties, Steamed rice, Idli, Oothappam, Pongal, Chapathi and even Poori varieties. I followed Chef Dhamu's recipe. 1. Dry roast the ingredients listed under "To roast & grind" except coconut. Grind the roasted items to a fine paste along with coconut and little water. 2). Heat oil in a pan, add fennel and let it splutter. Then add curry leaves, Onions, ginger garlic paste and green chillies. Saute till onions turn translucent. 3). Add the chicken pieces along with salt and turmeric powder, mix well. Add 1 - 1 1/2 cups of water and let the chicken cook in medium flame. 4). Once the chicken is 3/4 th cooked, add the grounded masala paste (with 1/4 cup water if needed). Cook till the raw smell goes from masala and the gravy reaches thick consistency. Garnish with coriander leaves and serve hot with pulao varieties or Tiffin varieties. # Gingelly Oil adds flavor to the gravy so don't skip it. # Chicken itself has tendency to leave water while cooking so add water accordingly. # Adjust the quantity of red chillies depending on its spice level.